With a week to go until Christmas, ski resorts are breathing a collective sigh of relief as snow finally falls across many parts of the Alps. However, low level resorts face a bleak future with scientists increasingly concerned about global warming. It's been one of the most worrying build-ups to the season on record with poor snow levels across Europe. 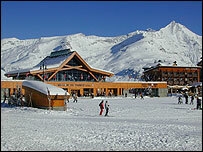 Earlier this month, the slopes of Tignes in France, one of Europe's highest resorts, were bare. I was there last week when the first snow fell and to say the resort was delighted would be an understatement. "This is always a very worrying time of year for ski resorts", says Fiona Sweetman from The Ski Club of Great Britain. 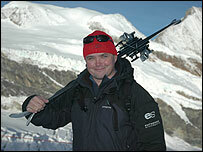 "If there is poor snow then the multi-million pound ski industry suffers badly." Austria has the best conditions in Europe with more snow set to fall this weekend. Obergurgl, Kaprun and Solden have near record amounts for this time of year. The most popular resort with the British, St Anton, does not have quite such good conditions but it has been very cold, -13C, so the resort has made large amounts of artificial snow. 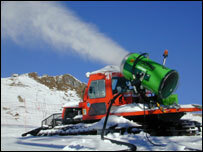 Snow cannons have been the saviour of many ski resorts as the warmer winter temperatures have meant less snow. All resorts now make artificial snow and pride themselves on how many cannons they have. However, they come at a huge environmental cost, blighting the landscape and using up large amounts of water and power. The Swiss resorts of Zermatt and Sass Fee now have thousands of people on their slopes. Many are professionals within the ski industry - instructors, guides and racers. "Quite frankly it's been a bit of a struggle these last few weeks", Julian Griffiths, a trainer with The British Association of Snowsports Instructors (BASI) told me out on the slopes of Zermatt. "Our students need reasonable conditions to pass their exams and we haven't had it. But now we have the snow it's changed everything." Hundreds of British instructors now teach in the European Alps - both in national ski schools and British run ones. In the Pyrenees, Andorra has had another good start with snow falling during the past few weeks. The principality has had an enviable snow record in recent years and now more British skiers go there than the USA, Canada and Switzerland combined. British tour operators have also thanked the snow gods as resorts now resemble the blue sky and powder snow pictures that adorn their brochures. The companies are blamed by some for selling as many holidays as possible for Christmas without pointing out to clients that often the low resorts receive little snow. "It's always nice when the first snow of the season arrives but this year it's particularly welcome as the snow is definitely later than normal and the worries about climate change and global warming have increased our anxieties", says Marion Telsnig from Crystal Holidays, the UK's largest tour operator. Many people book their Christmas holidays up to a year in advance to secure discounts and guarantee a place so they are taking a large risk on conditions. The latest UN report on climate change warns that within 50 years over 200 ski resorts may have to close due to lack of snow so it is easy to see why the snowsports industry is concerned about winter's late arrival.